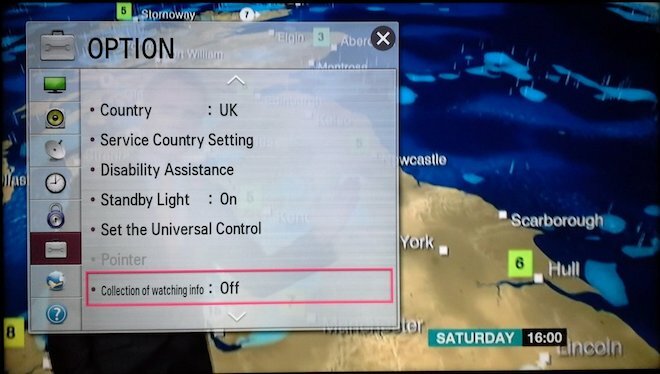 A report by blogger "DoctorBeet" from the UK detailed an option (above) on an LG Smart TV for "collection of watching info," which a network packet analysts indicated continues to collect and report data even after being turned off. Using Wireshark, a network utility to monitor local network traffic, the user found his Smart TV was transmitting a unique device ID listing the names of programs he watched, noting that "this information appears to be sent back unencrypted and in the clear to LG every time you change channel." The LG Smart TV was also found to the post names of media files he played from an external USB stick. 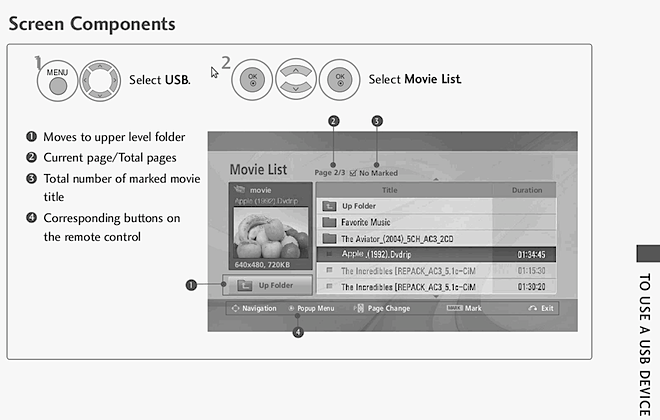 LG has previously depicted USB file playback as a way to watch pirated movies, portraying in a TV manual (below) a listing of files ripped from DVD, including The Aviator and Pixar's The Incredibles as reported by Torrent Freak. "It would easily be possible to infer the presence of adult content or files that had been downloaded from file sharing sites," he wrote. "My wife was shocked to see our children's names being transmitted in the name of a Christmas video file that we had watched from USB." "Good Morning. Thank you for your e-mail. Further to our previous email to yourself, we have escalated the issues you reported to LG's UK Head Office. Readers commenting on the report note that such behaviors may be subject to provisions of the UK Data Protection Act that restrict data collection, as well being as a "serious breach of EU Directive 95/46 on Data Protection." "LG Smart Ad analyzes users favorite programs, online behavior, search keywords and other information to offer relevant ads to target audiences. For example, LG Smart Ad can feature sharp suits to men, or alluring cosmetics and fragrances to women! "Furthermore, LG Smart Ad offers useful and various advertising performance reports—that live broadcasting ads cannot--to accurately identify actual advertising effectiveness." The video then depicts ads capable of targeting not only its Smart TV and BluRay players, but also the firm's LG Smart Refrigerator, "and more." The video specifically portrays advertising from State Farm insurance, Hyundai's Santa Fe vehicle and McDonalds, and outlines that ads portrayed on the Smart TV's home screen are found to "grab the most attention" in eye tracking tests "since the home screen is the first thing users see on Smart TVs." The company promotes the fact that its Smart TV uses the same size and shape of ad banners as web pages, allowing advertisers to reuse their existing internet advertising on Smart TV navigation screens, including the device's search results and "Smart World" and "Game World" TV app markets. LG's Smart TV is also described as adding pre-roll and post-roll ads to "target audiences" when users attempt to watch videos, following the model of Google's advertising in YouTube. A spokesperson for the company in the video states, "this is more about quality of view," explaining that with a Smart TV, "the relaxed person or family" offers a "different level of experience for audience and different level of value to marketers." "LG Smart ad brings compelling and more effective ads to you on a larger scale! Keep your eyes open for a smarter lifestyle made possible by LG Smart Ads. LG Smart Ad: making the world smarter!" 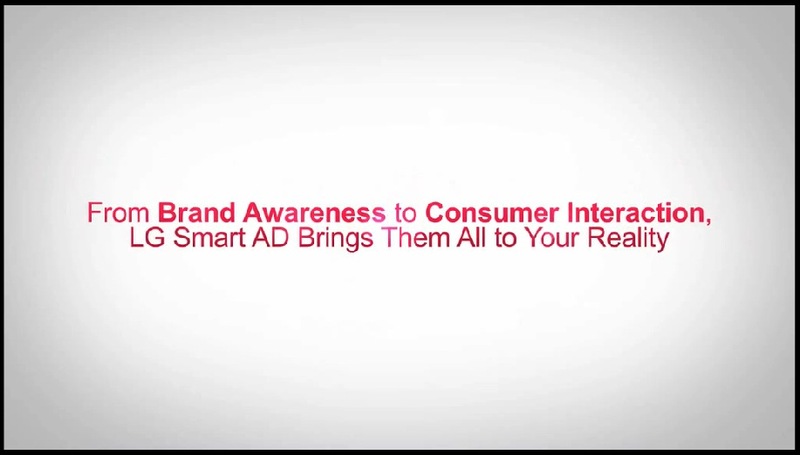 The video ends with the title text: "From brand awareness to customer interaction LG Smart Ad brings them all to your reality." LG further details its ad program on a website that boasts, "LG Smart AD offers real-time reporting that enables publishers to intuitively view and analyze the ad performance of the publications. The report is all time accessible through Seller Lounge, which is Smart TV application management portal. Its global settlement system ensures publishers' payments to be delivered anywhere in the world." Despite being a significant Android licensee in smartphones and an initial partner in the ill-fated Google TV initiative, LG has, since its acquisition of Palm's webOS from HP, distanced itself from a reliance upon Google in the TV space, choosing instead to blaze its own trail into TV ad revenue. This summer, LG's director of Smart TV content Matthew Durgin, when asked at a tech conference if Android would play a role in the company's future TV sets, answered, "Not that I can see, to be frank with you. I think that LG's TV platform has evolved to the point where it's become a very strong differentiator for us in the market." Citing the February purchase of webOS from HP, Durgin said LG now has "a development team in Silicon Valley who's developing for the 2014 platform using webOS." 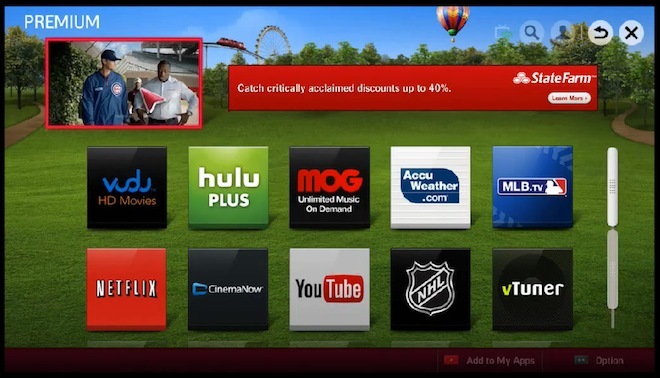 While borrowing the "smart" label from the smartphone industry, Smart TVs haven't been a huge hit with consumers. Samsung, Google and Microsoft are all pursuing the market with devices that attempt to deliver relevant, valuable advertising achieved through following viewer's behaviors. Apple TV, in contrast, has aimed more at selling content subscriptions and media purchased from iTunes, streamed from iCloud or beamed with AirPlay without adding any advertising or presenting banner ads on the home screen or throughout its navigation pages. With iTunes Radio, available on Macs, iOS 7 devices and Apple TV, Apple has embarked upon more conventional radio-style advertising that can be avoided with an iTunes Match subscription, an extension of Apple's iAd program. In 2010, at the release of iOS 4, Steve Jobs outlined iAd as a new way to help monetize free apps, noting that "people aren't searching on a mobile device like on a desktop," one of the first public hints describing how Post PC devices would differ from the PC model created by Microsoft in the 1990s. Rather than trying to replicate the banner ad experience of the web, Jobs outlined iAd as an effort to present a new type of interactive advertising that didn't simply take users to a web page but created an immersive environment for relating to a brand or exploring a product, an experience that was inviting, optional and easy to escape from.